The 19th-century British method of spicing up kidneys, chicken and prawns known as devilling always includes a good dash of Worcestershire sauce. By all means use raw chicken in this recipe, but it will take longer. 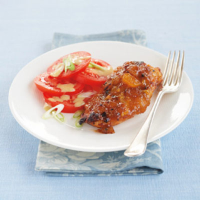 You'll need to roast it for about 35–45 minutes; using cooked chicken makes this lovely and quick. Preheat the grill. Slash the chicken skin and place on a foil-lined baking sheet. Mix the remaining ingredients together and season. Spread a third of the mixture over the chicken, turn and spread the same amount on the other side. Grill, skin-side down, for 3–4 minutes. Meanwhile, to make the dressing for the salad, place all the ingredients in a screw-top jar and shake well. Turn over the chicken and spread the rest of the mixture on the slashed side. Grill for another 5 minutes until hot right through and tinged with charred edges. Scatter the sliced tomato and onion onto 2 plates and drizzle with the dressing. Place the chicken on the plates and serve.